Have any of you played in other bands? We were Sluagh until we had to change our name (Someone trademarked it out from under us) so now we're Troll Teeth. Frank and Kyle have been in a band called Obey the Ooze, and Kyle is still the drummer in another band called B1nary Cur10us. Have you had other previous members? Too many to count. I've thought that having 2 guitars or maybe a keyboard player would be cool but in the early lineup, the 3 original members all played multiple instruments so when we were hovering around 4 or 5 people but only 3 people show up, we just cut the dead weight. It's just easier to be a 3 piece. What inspires you? I just try to avoid doing what other metals bands do. So many bands in our genre write songs about witches or magic. I want to be more thoughtful with lyrics and find symbolism or metaphors in things you wouldn't normally find them. How often and where do you reherse? Once a week out of a storage bin. It's a bunch of bands that rent this storage space so it's a tight fit but convenient location. How have you developed since you started with the music? The song structure becomes more complex because the members develop a chemistry not just with timing but in how to build songs. Do you have other interests of work outside the band? Yes, we all have different lives and music is only a small part of it. It's one of the many reasons why it takes so long to record. Are you looking for a booking agency, and what are your thoughts around that? Well currently I do all the shows and I'm very picky because I'm very particular with who we play with. A lot of bands are pretty cool but some are very flaky or unprofessional so I try to find bands that won't screw us by not showing up or just destroying the set or something. Are you looking for a label, and what are your thoughts around that? Eh, it be convenient but with our level of success, it's better to be independent. What made you decide to make this music? Our original guitarist Ben. He really has this like big catalog of styles and riffs and his leads just fit a loose but heavy style of playing. It's also a versatile genre. The name metal might scare some people off but when they hear the rhythm and riffs they open up a bit and can get into it. What are your songs about? They pretty much all have positive meanings in the 1st album. We're going to record a 2nd album this year and the 2nd album is going to be a whole lot more dark. Not outright negative but dark. Who does the composing and writes the lyrics? I do all the lyrics and I do the arrangements because I have to sing. So someone else might come up with a riff or song idea but I have to fudge things around so I'm not trying to sing and play an impossible part at the same time. Do you start with the music or the lyrics? Always the music. My philosophy is if you have a good song, good lyrics can make it a great song. If you have good lyrics and put average music behind it, you're going to get a band song. Always start with good riffs and a good foundation to build lyrics up from. Do you compose in a certain inviroment? Well the songs are always as a group, the lyrics are a lonely part of making a song. I have a notebook I put ideas in but I honestly hate writing lyrics because it is an uncomfortable process. Have you done any covers live? No, it literally is impossible to do because I'm too stupid to do covers. I can figure out a riff but to sit down an learn a whole song is stupid to me. It's easier to make a whole new song. What language do you sing in? English but I can do some songs in spanish. In a spanish class in college I got extra credit for composing a song in spanish. What are the least and most people to attend one of your gigs? 1. We had a few shows were only 1 person showed up. But that was very early on. Do you always play the same songs live, or do you vary? We can play what ever we want but we have a flexible set list but stick to 7 or 8 songs. Do you have a regular place you play live often? It used to be the Boneyard in Atlantic City, but the booking people there changed so we play where ever. We also moves so we're closer to Philadelphia now. What was your first gig like? Well it was a weird show because we got added late. Some band called Salted was coming up from Texas and the 3 other bands dropped off. We went up, jammed, I dove into the drum set and broke my drummer's foot while ripping my pants as well. It was a fun time. What was your latest gig? In a Firehall. It was fun. We played with Reckless X and KMX. KMX is a blast because they're hilarious. Really relaxed atmosphere. Have you had to cancel a gig? We were going to tour Canada for a 2nd time but our guitarist never got his passport in time so we had to cancel. That's the only time we had to do it. Where have you played live this year? New Jersey and soon Philly. We might add to the list. It's ever changing. Where do you plan to gig the comming year? Everywhere. The moon? who knows. Life is unpredictable. When did you start to sell merchandise, and what do you have for sale? 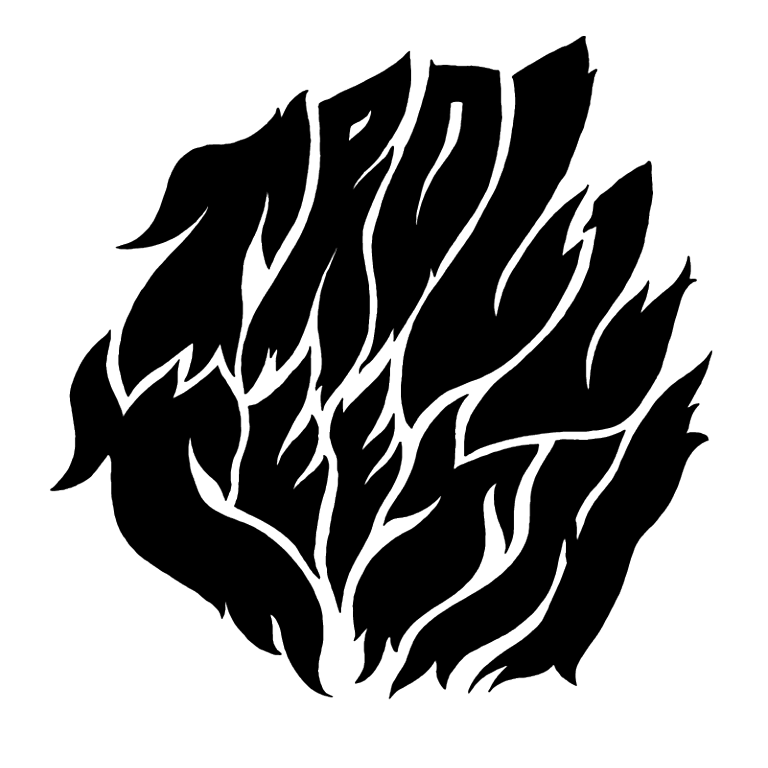 We have CDs for sale on our bandcamp page (trollteeth.bandcamp.com) and we're running a booster campaign to sell Tshirts for our 2nd album (https://www.booster.com/troll-teeths-2nd-album) that ends May 31st. We're getting more stickers sometime soon. So, we're getting there. What do you think about people downloading music instead of buying records now a days? I don't care. If you like the music, listen. Just show up to the shows. When you're a low level band like us, we make money from live shows. So please just show up to shows. How do you think the music industry have changed because of this? It's less monopolized. More bands and artists are independent so people can directly support who they like rather than going through a middleman. What do you think of my work? You're doing God's work, keep it up. How do you think and know that this interview will help you in the music business? Hopefully we can grap the attention of some folks and they dig us enough to say, "yea, I'll support these guys." It's a win-win if they do. They get stuff that brings them joy and we get to do what we love to do. Do you have any role models or idols? I try to avoid idolizing people. Never meet your heroes type situation where I know people are humans and can err. I like what some people do and it leads me down certain paths but within reason. Why do you think that they exist? Well they think, therefore they are. Is it easier to find inspiration from older bands, or bands that are more active today? Older. Bands like November, an old Swedish band, I think a lot of what did was crazy. Black Sabbath, Jimi Hendricks, Pentagram, etc. They didn't over think stuff. Just jam. What have been your biggest obstacles? Balancing life with music. What advice would you give other bands or artists? Don't rush things. I know plenty of bands who try and play shows before they have a set or a full line up. Take your time, make good music, when you're ready, then you can play shows. How do you get psyched for a gig? It's usually a pretty relaxed environment, our shows aren't much different than our practices. We joke around, we play, and just have a fun time. Do you have any new material? 2 new full songs, 6 skeleton songs that will be filled out for the 2nd album. What are your plans for the future? The future is a mystery, the past is history, today is a gift, that's why they call it the present. Do you have something to add? Don't sexually assault people. Don't pass dumb laws. Lower property taxes. Just let people live their lives.